Rivian Founder and CEO R.J. Scaringe speaks at the Normal plant in March 2017 during a visit from Gov. Bruce Rauner and other elected officials. One year later, Rivian is still a bit of a mystery, but not without good reasons. GLT interviews with electric vehicle experts across the country reveal a hypercompetitive industry where startups regularly miss deadlines and often never reach full-scale production. And Rivian’s founder and CEO, R.J. Scaringe, has said he learned the value of silence after his company dramatically changed course six years ago—the same pivot that brought him to Normal. Rivian hasn’t been completely silent. In December the company revealed that its first vehicle will be a five-passenger truck, introduced in 2020, followed by a seven-passenger SUV. That’s the same timeline laid out by Scaringe last year, when he said Rivian’s first vehicle would begin production in 2019 and be sold in 2020. The public still hasn’t seen the so-called “adventure vehicles.” Some Bloomington-Normal officials say they’ve ridden in a prototype. An image, apparently showing one of Rivian's new "adventure vehicles," included in Rivian's patent application for "Systems and Methods for Reconfigurable Electric Vehicles." Three pending applications filed by Rivian with the U.S. Patent and Trademark Office in the past year hint at what the vehicles may look like. 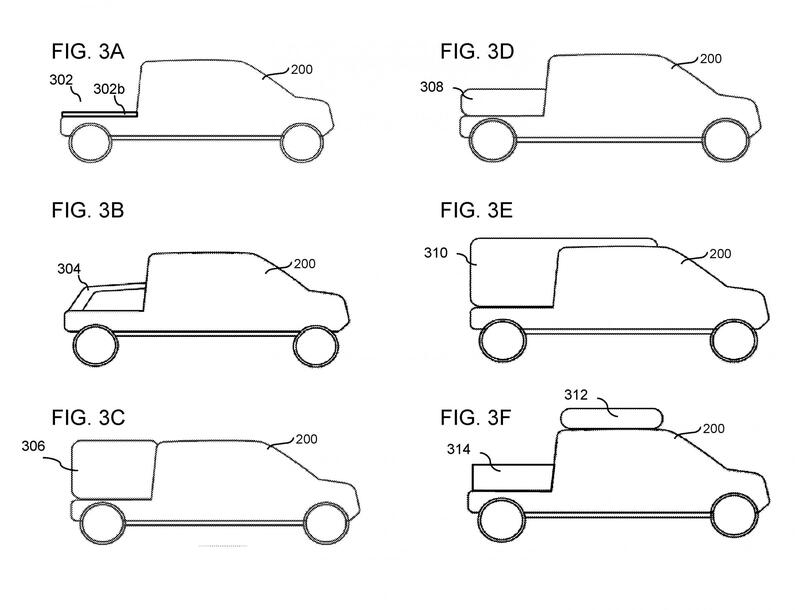 One patent application shows a shape-shifting EV truck that can change its cargo-carrying capability based on a driver’s need, such as commercial deliveries or a pop-up roof for camping. In one patent application, Rivian says “conventional EVs have relatively low rates of utilization and are structurally and technologically limited in their applicability to different types of uses.” A reconfigurable vehicle would remedy that, Rivian says. “(Rivian) determined that such technological enhancements to electric vehicles can provide for enhanced utilization of electric vehicles,” the application reads. Scaringe has not been available for media interviews. A spokesperson says he’ll likely do interviews in February. Rivian tweeted for the first time just last week. In a statement Friday to GLT, Rivian spokesperson Samantha Flynn said the company is on target for its 2020 timeline. 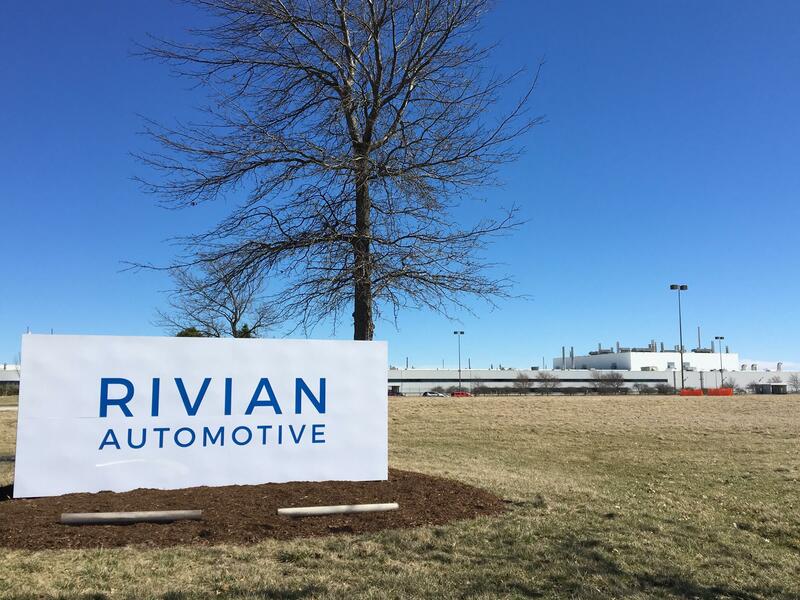 “Following its acquisition of the former Mitsubishi plant, Rivian has hired its core staff to maintain and evaluate the building, grounds, equipment and systems at the site,” Flynn said. “The process of evaluating the production equipment is well underway, and the company is now determining the modifications required to make the plant production ready. One reason why Bloomington-Normal is anxious to learn more about Rivian is because taxpayers have skin in the game. To get the tax breaks, Rivian must provide local and state officials proof they’ve met those hiring and investment requirements. Rivian has provided the Bloomington-Normal Economic Development Council with paperwork on expenditures and improvements for 2017, EDC CEO Kyle Ham told GLT. Ham said he expects to formally brief local taxing bodies on Rivian’s performance in February. During an interview on GLT’s Sound Ideas in 2016, Scaringe said the Bloomington-Normal community—not just the plant—won him over. “The community that surrounds the plant is something special. If you look at other plants within the Midwest and areas that have been affected by other plants shutting down or manufacturing moving out, you don’t have this level of energy, and you don’t have this level of progressive thinking,” Scaringe said. Bloomington-Normal community leaders will likely visit Rivian’s vehicle-development facility outside Detroit sometime this spring, said Normal City Manager Mark Peterson. He said he’s encouraged Rivian to provide an update to the community early this year. Rivian bought the Mitsubishi plant and its contents for $16 million. "People are just curious. They’re supportive, but they really want to know what’s going on out there. And I think there’s a lot to talk about, because they’ve been working very hard the past 12 months, and some of the result of that will become apparent soon,” said Peterson. Rivian’s history may explain its quiet 2017. Because like many EV startups, Rivian didn’t take a straight path to its current business plan. The company was founded as Mainstream Motors in Florida in 2009—a turbulent year for the auto industry, with GM and Chrysler filing for bankruptcy, and a tough time to raise money for a startup. The company was renamed Avera Motors, and finally Rivian in 2011. Scaringe, who earned a Ph.D. in mechanical engineering from MIT, was initially working on a fuel-efficient—not electric—car. That never panned out. At the end of 2011, Scaringe pivoted away from that original product and began work on EVs, subsequently lining up “hundreds of millions of dollars” from investors. It was an uncertain time for the company’s direction and product strategy. “And because of frankly some of the things we talked too much about in the early days, we made the decision to go deep into stealth mode, and to avoid the distraction of committing to things and making statements that are highly likely to change,” Scaringe told GLT. Ultimately, what Rivian says doesn’t matter as much as what Rivian does. And it wants to do something incredibly difficult—become a full-scale EV automaker. So far, Elon Musk’s Tesla is the only EV startup that’s really done that, and even that company has faced significant delays and challenges. There’s also increasing competition from Chinese companies and established American automakers. Tesla announced last month it too wants to build an electric truck. And the appetite for EVs among consumers is still limited, said Jeremy Michalek, a professor at Carnegie Mellon and director of its Vehicle Electrification Group. Only about 1 percent of new-vehicle sales in the U.S. are EVs, he said. Rivian’s investors are largely a mystery, with one exception: Sumitomo. The Japanese company with a U.S. operation based in New York announced in December it’s now a “strategic investor” in Rivian. Sumitomo will "support Rivian’s business development through its network in North America and its supplier relationship where Sumitomo has deep business experience and relationships across the world,” the companies said. Sexton, the EV advocate, said many EV startups make the same mistake—underestimating the amount of capital it will take to launch a brand-new car. Even Tesla’s delays have raised concerns about whether it will need more cash. 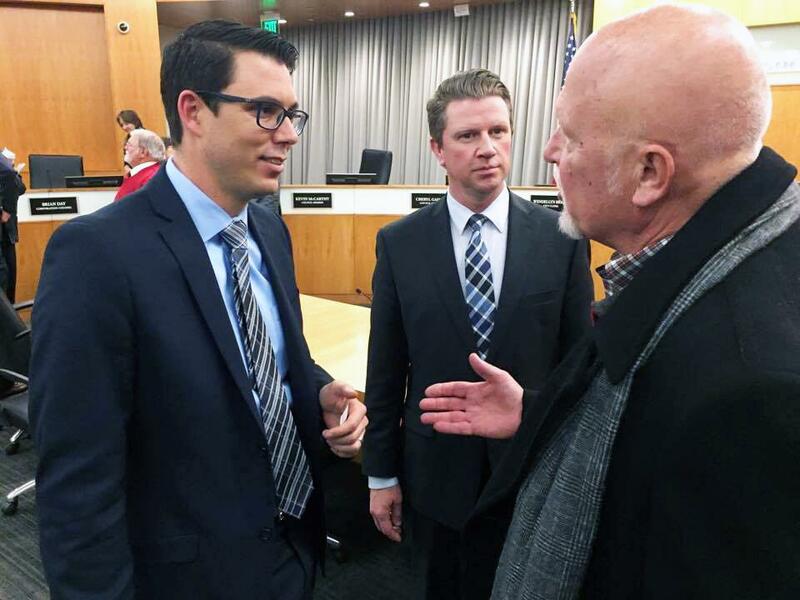 Rivian's R.J. Scaringe, left, speaks with the Mitsubishi plant's former manager, Jerry Berwanger, right, and Bloomington-Normal Economic Development Council CEO Kyle Ham at a Normal Town Council meeting in December 2016. “It’s even things like roadside assistance. All that stuff that you think about when you buy a car, that ecosystem that comes with it, it all costs a tremendous amount of money. And folks almost universally underestimate that cost when they get into this game. Even startups that are composed—as Rivian is—by some veterans of the industry,” Sexton said. One advantage that Rivian has its own manufacturing plant. Rivian acquired the plant and its contents for $16 million, said Flynn. Rivian is expected to invest $175 million into the plant over the next eight years. But even that advantage doesn’t make Rivian a surefire success. The startup hybrid automaker Fisker got help from state and federal taxpayers to buy an abandoned General Motors plant in Delaware in 2009. But Fisker filed for bankruptcy four years later without ever building its car or bringing promised jobs to Delaware. “We all root for all these companies, but at the same time we have to be fairly realistic about the chances of a brand-new auto company succeeding on its own without being at a minimum acquired by a larger one,” Sexton said. The best clues about where Rivian is headed might be found in the people it's hiring. Rivian has 250 employees across the country, according to Sumitomo. That includes 27 based in Normal, including a dozen former Mitsubishi maintenance staff who’ve returned to their old plant, said Ralph Timan, a union leader who worked at Mitsubishi. Rivian also recently hired a local plant manager, said Peterson. Rivian is now hiring manufacturing workers in Normal, according to its website. The company is not required to meet any local hiring thresholds until the end of 2018, when it must have 35 full-time employees to get its tax breaks. Rivian told GLT it expects to meet or exceed its job-creation targets for 2018 and 2019. "The most critical aspect is putting together the right team." The company’s website now lists the full leadership team, including many executives with extensive experience in the auto industry. Rivian’s focus on self-driving vehicles—also called autonomous vehicles—is one that other EV carmakers have tried, notably Tesla and its Autopilot feature. In his 2016 interview, Scaringe said Rivian’s first vehicle will “exist in an ownership-centric world,” meaning people can buy one. Its future vehicles will be “designed purely for mobility as a service,” possibly meaning a fleet of self-driving cars on call. There are many reasons why self-driving vehicles and electrification make sense together, said Michalek, the Carnegie Mellon professor. “If you can get to the level where the vehicle can go out and refuel itself and come back without a driver in it, that’s particularly nice for those potential future buyers who may not have off-street parking at home with a personal charging station. If the vehicle can charge itself, that suddenly opens up the market for EVs,” Michalek said. 2018 could be a big year for EVs. Tesla is expected to ramp up production on its first mass-market EV, the hotly anticipated Model 3. Jaguar, Audi, and Hyundai are also releasing new EVs. An excerpt from GLT's story about Rivian. GLT's full story about Rivian. Editor's note: This story has been updated to reflect the purchase price for the Mitsubishi plant. A Rivian spokeswoman says the plant and its contents were purchased for $16 million. The original $2 million figure published initially with this story was not accurate, she said. An online auction of equipment formerly part of the Mitsubishi manufacturing plant is being organized by Maynard's Industries for Rivian Automotive.